(edited) Our article is now available online in Phys. Rev. Lett. ! In presence of impurities, ferromagnetic and ferroelectric domain walls slide only above a finite external field. Close to this depinning threshold, they proceed by large and abrupt jumps, called avalanches, while, at much smaller field, these interfaces creep by thermal activation. In this work we develop a novel numerical technique that captures the ultra-slow creep regime over huge time scales. We point out the existence of activated events that involve collective reorganizations similar to avalanches, but, at variance with them, display correlated spatio-temporal patterns that resemble the complex sequence of aftershocks observed after a large earthquake. Remarkably, we show that events assembly in independent clusters that display at large scales the same statistics as critical depinning avalanches. We foresee this correlated dynamics being experimentally accessible by magneto-optical imaging of ferromagnetic films. Our article “Inertia and universality of avalanche statistics: The case of slowly deformed amorphous solids” accepted for publication in PRE. In this paper, with Kamran Karimi and Jean-Louis Barrat, we solve numerically the dynamics of an amorphous solid under deformation in the quasistatic driving limit, by means of a finite elements technique. We study the noise statistics of the stress-strain signal in the steady state plastic flow, focusing on systems with low internal dissipation. We analyze the distributions of avalanche sizes and durations and the density of shear transformations when varying the damping strength. 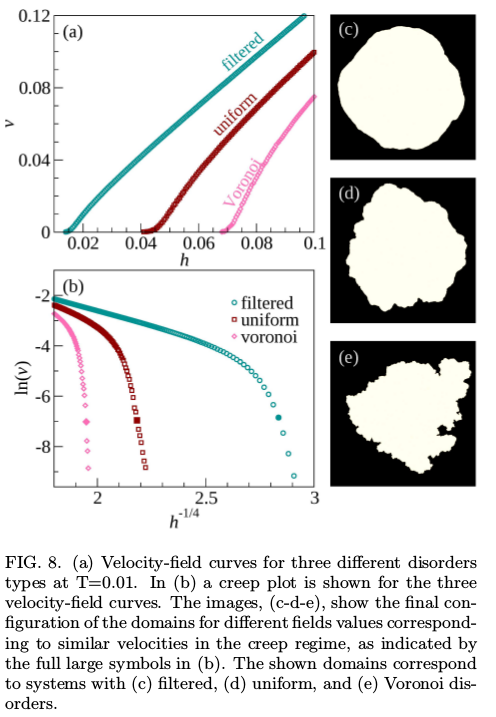 In contrast to avalanches in the overdamped case, dominated by the yielding point universal exponents, inertial avalanches are controlled by a non-universal damping dependent feedback mechanism; eventually turning negligible the role of correlations. Still, some general properties of avalanches persist and new scaling relations can be proposed. It will be available soon in PRE. Our article “Spatio-temporal patterns in ultra-slow domain wall creep dynamics” is now on arXiv! Together with Laura Foini, Thierry Giamarchi, Alejandro B. Kolton and Alberto Rosso we studied the slow creep dynamics of elastic interfaces moving in disordered media. In presence of impurities, ferromagnetic and ferroelectric domain walls slide only above a finite external field. Close to this depinning threshold, the wall proceeds by large and abrupt jumps, called avalanches, while, at much smaller field, it creeps by thermal activation. In this work we develop a novel numerical technique that captures the ultra-slow creep regime over huge time scales. We point out the existence of activated events that involve collective reorganizations similar to avalanches, but, at variance with them, display correlated spatio-temporal patterns that resemble the complex sequence of aftershocks observed after a large earthquake. Remarkably, we show that events assembly in independent clusters owning the same scale-free statistics as critical depinning avalanches. This correlated dynamics should be experimentally accessible by magneto-optical imaging of ferro- magnetic films. The article (in preprint) can be find here on on the arXiv repository. Our article “Driving rate dependence of avalanche statistics and shapes at the yielding transition” has been accepted for publication in PRL! We study stress time series caused by plastic avalanches in athermally sheared disordered materials. Using particle-based simulations and a mesoscopic elasto-plastic model, we analyze size and shear-rate dependence of the stress-drop durations and size distributions together with their average temporal shape. 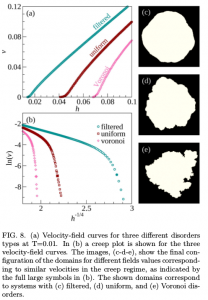 We find critical exponents different from mean-field predictions, and a clear asymmetry for individual avalanches. We probe scaling relations for the rate dependency of the dynamics and we report a crossover towards mean-field results for strong driving. You can find it here on arXiv, and here published in Physical Review Letters. In this article we obtain, using semi-analytical transfer operator techniques, the Edwards thermodynamics of a one-dimensional model of blocks connected by harmonic springs and subjected to dry friction. The theory is able to reproduce the linear divergence of the correlation length as a function of energy density observed in direct numerical simulations of the model under tapping dynamics. We further characterize analytically this divergence using a Gaussian approximation for the distribution of mechanically stable configurations, and show that it is related to the existence of a peculiar infinite temperature critical point. Update: It is now published in Physical Review Letters!